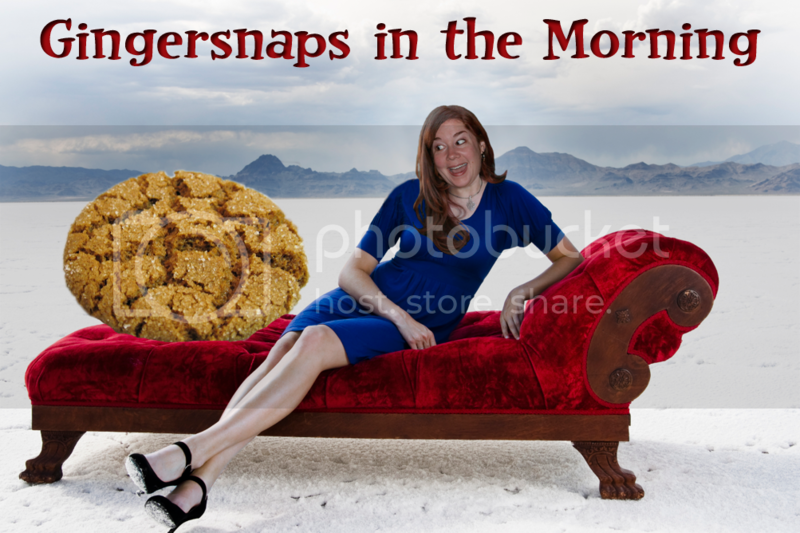 Gingersnaps In The Morning: When Squirrels Attack! 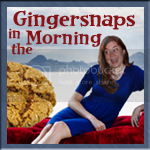 Moaning Myrtle Monday my little gingersnaps. How was your weekend? No really, you guys know I want to hear about it. Tell me in the comments. My weekend? Consisted of rain. Monsoon-type rain. Whoever said it never rains in Southern California should have a pie thrown at them. But at least we got to stay in and watch Kung Fu movies together while cuddling under a fleece blanket. All five humans and four kitties. It was lovely. Then on Sunday Mr. Ginger took an afternoon nap with Dobby. 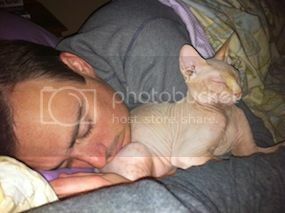 He totally didn't wake up to me flashing my iphone while I took picture after picture of the two of them and neither did Dobby. You wanna see? Of course you do! Shhhh... don't tell him! Tell me that second picture is not the silliest thing you've ever seen. You know the only thing that would make those pictures cooler? If Mr. Ginger's hair was dyed electric blue (which he'll do if he reaches his fundraising goal for Charity:Water). Come on, people, it's a worthy cause AND we'll get to see Mr. Ginger with blue hair!!! Just $20 provides clean water for 1 person for TWENTY YEARS. For serious. Click Here to see his page. AND a big celebrity generously donated to Mr. G's campaign. But you gotta visit the page to find out who! Now on to the news. 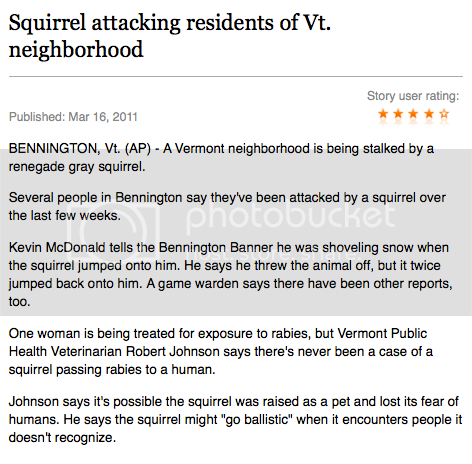 Ladies and Gents... there is trouble a brewing... a gray squirrel is on the loose in a sleepy Vermont town, attacking the residents. One poor guy was shoveling snow when the squirrel jumped on his back. He shook it off, but it jumped on him two more times. You guys know the solution for this, right? High. Powered. Rifle. I hear they taste like chicken. 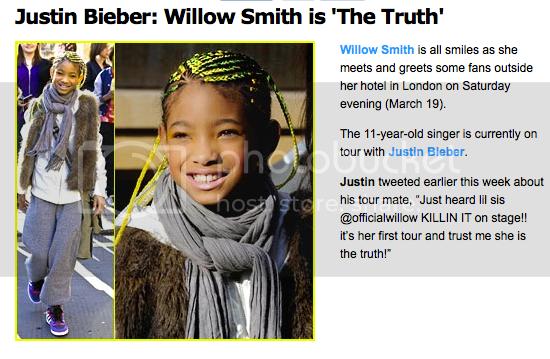 In teeny bop news, Willow Smith is currently on tour with Justin Pooper Bieber. Justin tweeted this week, "Just heard little sis @officialwillow KILLIN IT on stage!! It's her first tour and trust me she is the truth!" Uh, what does that even mean? Does that mean she speaks the truth? That she doesn't lie? I don't speak teeny bopper anymore. Someone please help me interpret this! Hey guys, have you ever wished you had a six-pack, but you don't want to put the time and energy into exercising? Fear no more! 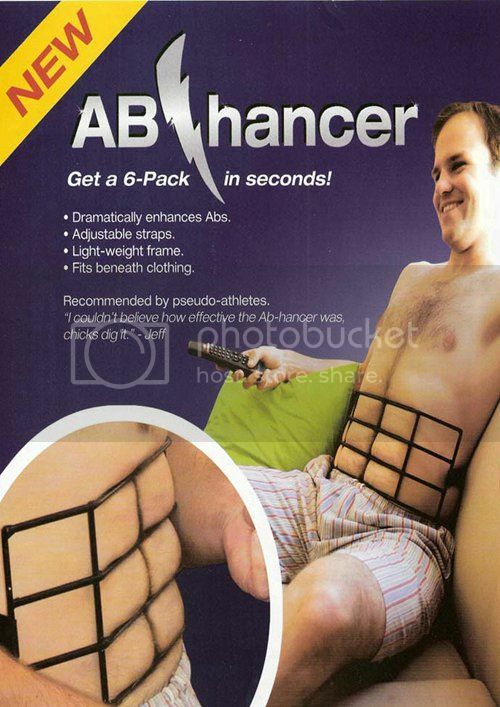 Now there is the new AB Enhancer! You wear it around your waist, and it squishes your fat tummy into six-pack shape, so under your shirt it will look like you are totally buff. Or that you have strange fat deposits. It says it's recommended for "pseudo athletes". Which pretty much means if you're NOT an athlete, this is recommended for you. Hey, WTF??!! Number 1. Please tell me this is a real product. Number 2. Why did I not know about this when my kids were babies? Number 3. Does it work on pre-schoolers? Number 4. If you're my adoption social worker, I'm TOTALLY kidding about numbers 1-3. A California couple got married over Skype! Actually, two couples have made use of Skype for their nuptials. Sean Murtagh and Natalie Mead were waylaid in Dubai when an Iceland volcano disrupted their flight plans. They had already been legally married in Australia, but they intended to exchange vows in a public ceremony back home in London. Rather than wait for the next flight to London to have their ceremony, they arranged their wedding in their hotel in Dubai, and used the online videoconferencing software to allow their friends and family to watch. The hotel even chipped in and gave them a three layer wedding cake! You can read about their wedding here. In perhaps an even more unusual move, Helen Oh and Samuel Kim also married over Skype, but the bride and groom weren’t even together! Kim was in the hospital, so they arranged to install a jumbo screen in a church in Fullerton, CA so he could attend his wedding digitally. You can read about their wedding here. This weekend was our anniversary "observed" (actual anniversary was on Thursday)-so we celebrated with Louisiana tourism fun and the local St. Patty's day Parade and dinner (where, we saw the blonde dude from super troopers & beerfest, etc) and Jimmy from That Thing You Do having dinner. It was a weird B List sighting to have here in the Red Stick. I love cat chilling on the bed. The look on its face is the best-like, dude, I'm chilling here, get that camera out my face! 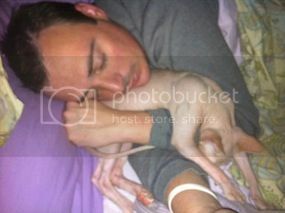 the pics of your husband and Dobby are so cute-the second one is awesome. I spent my weekend flipping between the Harry Potter weekend on ABC Family and the basketball games going on. So excited for HP to come out!